A Platter of Thoughts, Food! !, Wine!! Participating bars and restaurants include: 1925 Cocktail Lounge, a. Bar, a. Kitchen, Ben & Jerry’s, Butcher and Singer, The Continental Mid-town, The Dandelion, D’Angelo’s Ristorante Italiano and Lounge, Davio’s Northern Italian Steakhouse, Devon Seafood Grill, The Foodery at Rittenhouse, Lacroix, Ladder 15, Library Bar, Marathon Grill, Melograno, Parc, Qdoba, Ranstead Room, Rouge, Sbraga, Termini Bros. Bakery, Volver, Zama and more. 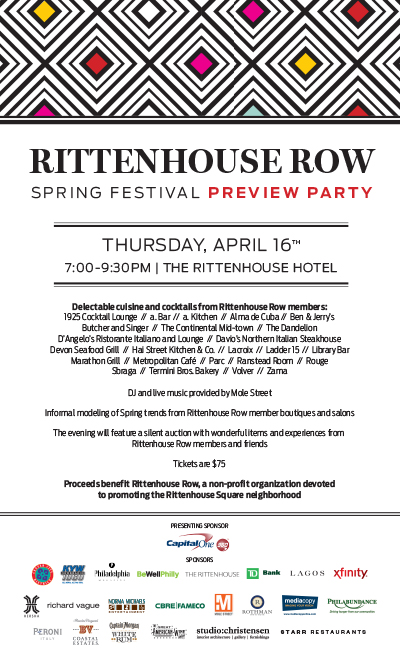 Proceeds from the event will benefit Rittenhouse Row, a non-profit organization devoted to promoting the Rittenhouse Square neighborhood (bold) The Rittenhouse Row Spring Festival Presented by Capital One will be held on Saturday, May 2 from noon to 5 pm rain or shine. Held on Walnut Street from Broad to 19th, the annual event showcases Philadelphia’s finest fashions, cuisine and entertainment and attracts more than 50,000 people to enjoy the best of Rittenhouse Row. 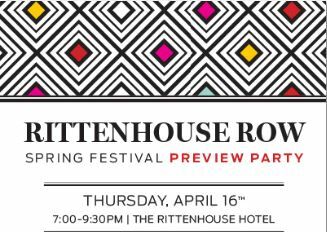 For more information and to purchase tickets visit www.rittenhouserow.org. Hope to see you there.